Fujitsu Laboratories Limited today announced the development of wireless recharging technology that enables the design of magnetic resonance-based wireless charging systems that can simultaneously recharge various types of portable electronic devices. This technology not only promises more compact and more efficient power transmitters and receivers, it also offers the ability to design charging systems in 1/150th the time currently required. In addition to dramatically shortening development times, this technology paves the way to integrating compact wireless charging functions into mobile phones and enabling multiple portable devices to be charged simultaneously without any restrictions on their position with respect to the charger. Details of this technology are being presented at the 2010 conference of the Institute of Electronics, Information and Communication Engineers (IEICE), opening September 14 at Osaka Prefecture University. Wireless charging has become an increasingly desirable technology in recent years, as people are eager to avoid the clutter and inconvenience of using power cables to recharge their mobile phones, digital cameras, notebook computers, and other portable electronics. Electromagnetic induction and magnetic resonance are the methods most often used for wireless charging. With electromagnetic induction, a magnetic flux is induced between the power-transmitting and power-receiving coils, and operates based on electromotive force. This method has been used in cordless phones, among other equipment. The drawbacks are that the method only works over short distances, and the power transmitter and power receiver need to be in alignment, so it is effectively no different than using a charging station with a wired connection. By contrast, the magnetic resonance method, which was first proposed in 2006, uses a coil and capacitor as a resonator, transmitting electricity through the magnetic resonance between the power transmitter and power receiver. 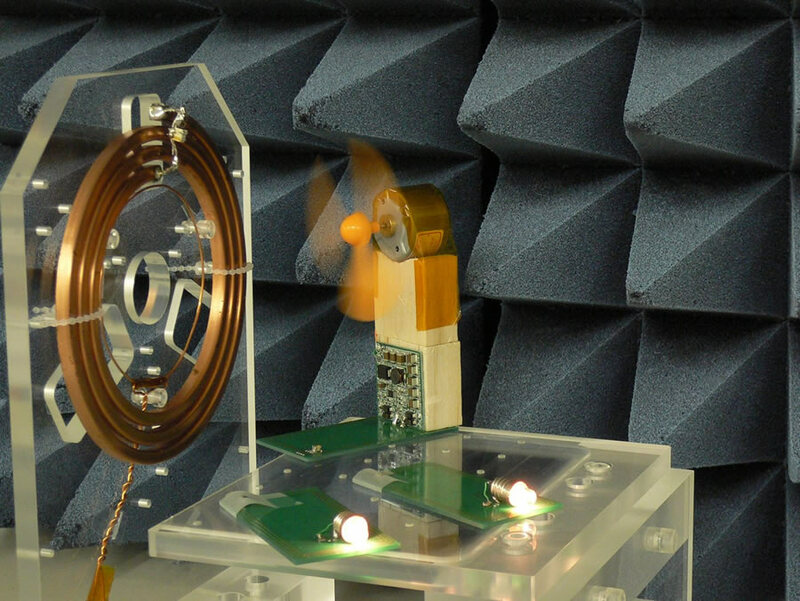 This method can transmit electricity over a range of up to several meters, and because a single transmitter can power multiple receiving devices, developments are under way for a broad range of potential applications, charging everything from portable electronics to electric cars. When designing transmitters and receivers for use with magnetic resonance charging, the size of the device determines the size of the coil, and this, in turn, determines the optimal capacitor capacitance. The effects of stray capacitance, which depends on the shapes of the transmitting and receiving coils, and other forces, such as magnetism in the device's chassis or batteries, exert complex influences over the resonance between the transmitter and receiver. Untangling these influences and resolving them in the design phase takes a significant amount of time. Using a high-end personal computer, just the basic design for a transmitter and receiver can take roughly 24 hours, and the smaller the devices are, the more difficult the computations. This has made magnetic-resonance charging impractical to incorporate into mobile phones, where miniaturized transmitters and receivers are highly prone to external influences. Furthermore, charging multiple different devices at the same time brings a different set of influences for each device, and analyzing these complex influences has been extremely difficult. Implementing wireless charging for compact portable electronics that require complex designs has been slowed mainly by the technological problems associated with design and analysis. What Fujitsu Laboratories has done is to develop technology that dramatically shortens the time required to design transmitters and receivers for magnetic resonance charging systems and, in addition, enables accurate tuning of resonant conditions in the design phase, even for compact transmitters and receivers that are prone to influences from nearby metallic and magnetic objects. 1. A magnetic field analysis simulator which analyzes the coil model and a specialized circuit simulator which analyzes the resonance conditions, including the capacitor model, are combined, making it possible to quickly and accurately design wireless charging systems for multiple transmitters and receivers at once using a variety of coil sizes. 2. The design of the wireless charging system can be automated to precisely match the desired resonance requirements, based on an assessment function which maximizes the charging efficiency. Together, these two technologies represent the world's first practical magnetic resonance design simulator which enables rapid and precise designs for transmitters and receivers according to the desired resonance requirements. This analysis and design technology was used to design a compact, slim power receiver, and to manufacture prototype mobile phones with built-in wireless charging. The prototype mobile phones can charge anywhere within the power-transmitter's range, regardless of their position in reference to the transmitter, with 85% efficiency. Charging performance varies with changes in the size of the transmitter's coil in an analysis of the simultaneous charging of multiple devices, where a single transmitter was transmitting to three receivers. This analysis, which found the optimal coil size for efficiently charging three devices, took roughly 10 minutes, or 1/150th the time it had taken before. Even with multiple transmitters and receivers, the design time is dramatically reduced. Fujitsu plans to continue using this analysis and design technology in research and development on wireless charging systems for mobile phones and other portable devices, and plans to bring products using it to market in 2012. The company is also looking at applying the results of this work to fields other than portable electronics, including power transmission between circuit boards or computer chips, and providing mobile charging systems for electric cars. That is super cool! It has been a dream for quite some time already. Finally it is here!